I hope you had a great Thanksgiving and your Maltese enjoyed all the leftovers! I know alot of people are gearing up for the holidays and our family is no exception. Our tree is up and Marley and Disco already have some presents in their stockings. Don't tell them, but I got them some of their favorite treats this year... bully sticks! I'm still adding more content and I'd love to know what you think. If you haven't already, tell me what you want to know about Maltese and I'll enter you in a drawing to receive a free book. You'll also get a discount once the book is published. Would you please give me some advice: I love my 3 year old Maltese but she barks constantly. Sometimes for no visible reason. I have tried so many devices but nothing works. She wants to sit in my lap all the time. She doesn't bark then, please help me. Thanks. I know how frustrating this can be because my Maltipoo Disco is a barker too! First you need to determine exactly what is the cause. It could be play barking, boredom, frustration, fear, or even seperation anxiety. Keep in mind that older Maltese can sometimes become senile and bark for no reason while young puppies are just "finding their voice." 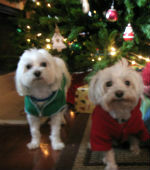 Still shopping for Christmas gifts for your Maltese? 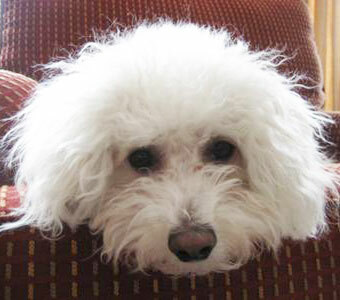 Find all the latest pet supply coupons in one place at this new site called CouponGravy. I love this site because I don't have to search everywhere to find great dog coupons anymore. I just go to this site and I'm done, it's so easy! Are you traveling with your Maltese for the holidays? Win $48 worth of all-natural remedy mists from Earth Heart, Inc. that can help your dog stay healthy and happy during this hectic holiday season. Only 4 more days left to enter, so do it now! Good luck! The "Cutest Small Dog Costumes for Maltese Photo Contest" was a hit and Maltese dog lovers submitted some cute and creative entries. There was everything from Uncle Sam to a Chia Pet. See who was the official winner! 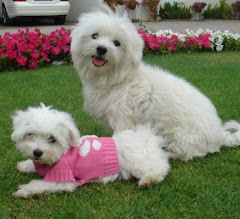 This month I'm featuring a cool Maltese blog from Snowy and Crystal. They're two dogs from Dubai and they have the most awesome adventures. Be sure to check out pictures and video from their latest surfing lesson, so cute! Feel free to leave a comment on their blog to encourage them to go on even more cool adventures! Wondering what's the best dog food to feed your precious Maltese? Try Blue Buffalo Dog Food , it's highly recommended by other Maltese Maniacs and is a great all-natural way to reduce eye stain. Looking for a one-of-a-kind gift for your Maltese or another cool dog you know? Check out these personalized pet gifts from RitzPix . They have a dog bowl, pet tag, and pet area mats which can all be customized with your dog's picture, graphics, and text. "It's no coincidence that man's best friend cannot talk." Lil' Paws Maltese Rescue is a rescue organization dedicated to helping homeless Maltese and other small dog breeds in the Austin, TX area. Click here to find out how you can volunteer and make a difference. You can also send a much needed donation.